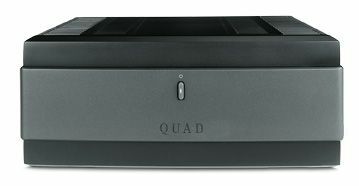 Quad QSP review | What Hi-Fi? You’ve got to hand it to Quad, it’s difficult to mistake its electronics for anyone else’s. Even something as straightforward as this QSP stereo power amplifier (number of fascia buttons: one) could only be a Quad: its 33cm-wide chassis is a dead give-away. As is the way with power amplifiers, the QSP’s appeal is overwhelmingly about the sound it makes. The casework is sturdily finished, sure, but when a power on/off switch, a pair of RCA inputs and two pairs of speaker-cable binding posts are the extent of a product’s external features it’s difficult to get over-excited. At least the Quad is a little more stimulating under the hood. Its claimed power output of 140W per channel into an 8-ohm load seems entirely plausible, and while Quad’s patented ‘current dumping’ technology sounds far from glamorous it’s undeniably effective. Put simply, it utilises both low-power Class A amplification and a high-power current-dumping section in an effort to combine the inherent finesse of the Class A output with the power and authority of the current dumper. In action, the Quad is a confident, vigorous listen. From the very top of the frequency range to the bottom of the midrange it’s an upfront performer, willing to grab recordings by the scruff of the neck and drive them forward inexorably. Open and revealing, with a real facility for vocal nuance and subtlety, it’s as enjoyably enthusiastic and poised a stereo power amp as we’ve heard in a good while. Problems, such as they are, concern low-end reproduction. Fed by our reference Bryston BP26 pre-amplifier, bass is rather vague, soft-edged and uncertain – almost the exact opposite, in fact, of the rest of the frequency range. Switching to Quad’s matching Elite pre-amp brings a deal more solidity and certainty to bass, but much of the thrilling clarity and expression of the midrange goes missing at the same time. This, then, is a power amp that demands a good deal of system-matching. Find its most sympathetic partners, though, and you’ve as communicative a device as £1200 can buy.